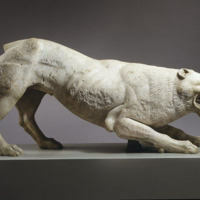 Marble Statue of a Lion is a funerary monument of a lunging lion. 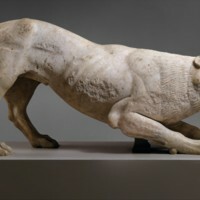 The body creates a line that directs the viewer to the detailed face, suggesting that the lion is moving forward. The muscles of the thigh and upper torso are prominently shown, as well as the ribs in the stomach and the veins in the leg. It was made during the Classical era of Ancient Greece, a period characterized by artistic renewal and the rise of naturalism and harmony, led by Polykleitos (450-420 BCE). It was most likely owned by a wealthy family, who put it by their grave to show their power and to protect the grave. Later, it was taken to southern Italy and ultimately found in Trastevere, Rome. The piece is historically significant in relation to Greek funerary practices. It reflects the transition from small lēkythoi, toward lavish funerary monuments surrounded by marble statues. It is also significant because of how it fits into one of the most artistically productive periods in art history. Its creation at a time when artists grappled with naturalism and the living body is important and can be seen in the work itself. 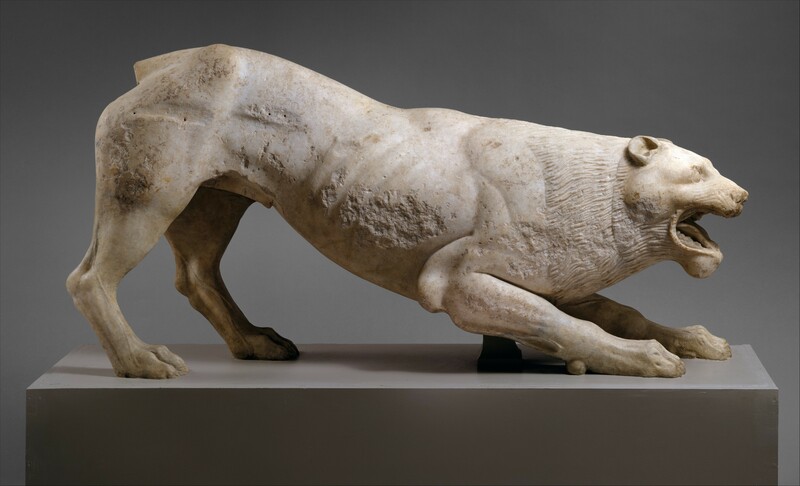 In Janson's History of Art, Marble Statue of a Lion fits well between Kritios Boy (fig 5.29) and Doryphoros (fig 5.33). It lends itself more towards naturalism, but does not reach the proportional, idealistic standards of Doryphoros. It would serve well as a supplement to the statue, Diskobolos (fig. 5.32), which plays with the idea of movement while also emphasizing the construction of the body and the detail of the muscles and bones. 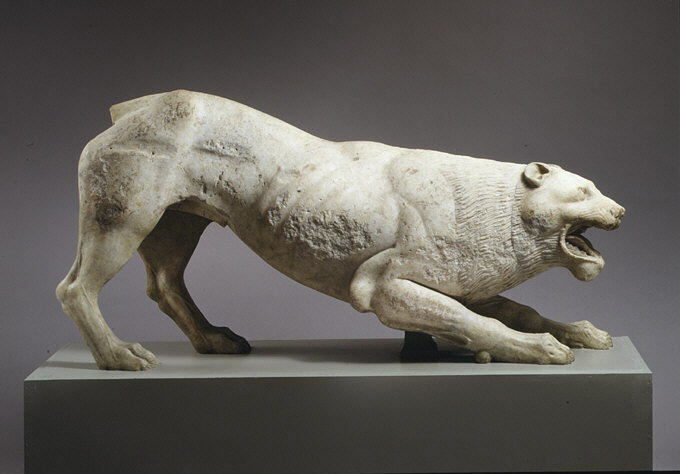 “Marble Statue of a Lion,” accessed April 22, 2019, http://metsurvey.kenyoncip.org/items/show/38.